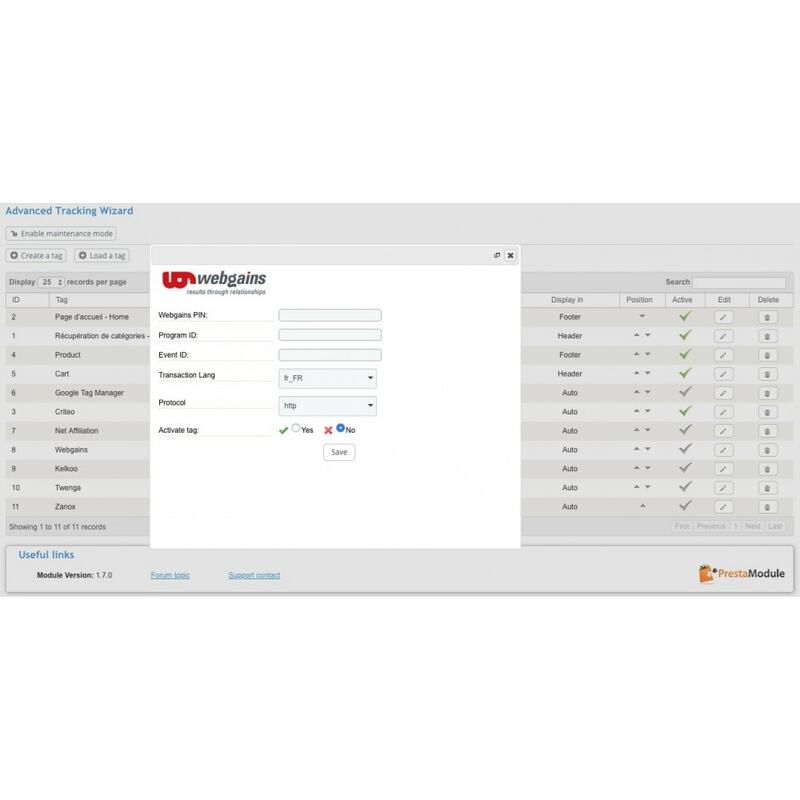 Adding trackers to your website has never been that simple with Advanced Tracking Wizard ! Insert into your pages the scripts provided by Google Analytics, Google AdWords, market-places, comparators, or affiliate network. No skills are required to install tracking tags given by your partners ! Choose a page where you want tags to appear, copy/paste the code given by your partner, add dynamic variables (Total, customer e-mail...) and SAVE ! 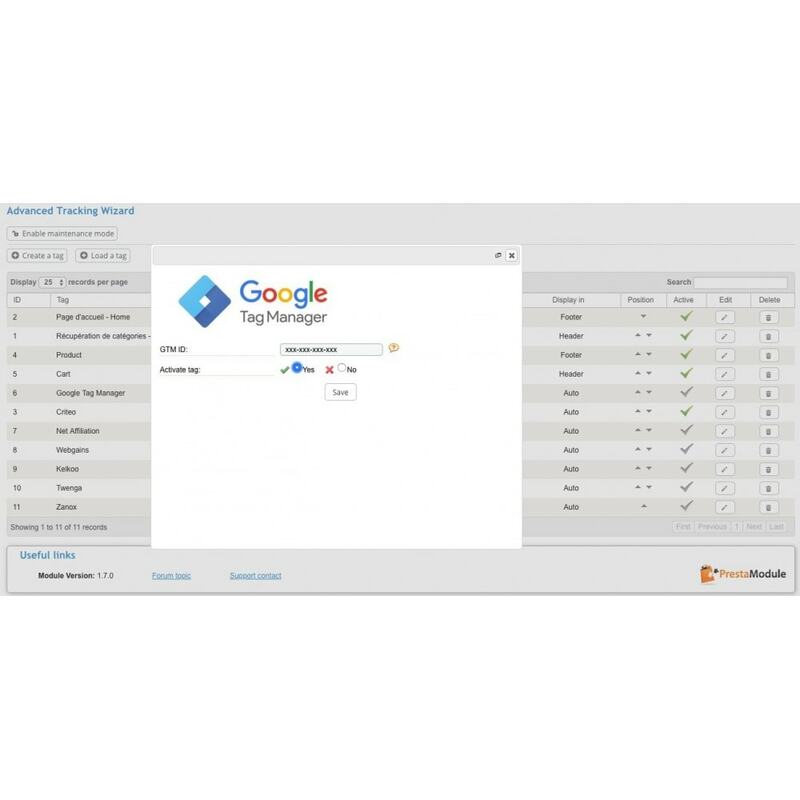 Advanced Tracking Wizard is shipped with predefined trackers for Google Tag Manager, Net Affiliation, Criteo, Zanox, Kelkoo, WebGains, Sociomantic et Twenga (Ready To Sell) services. 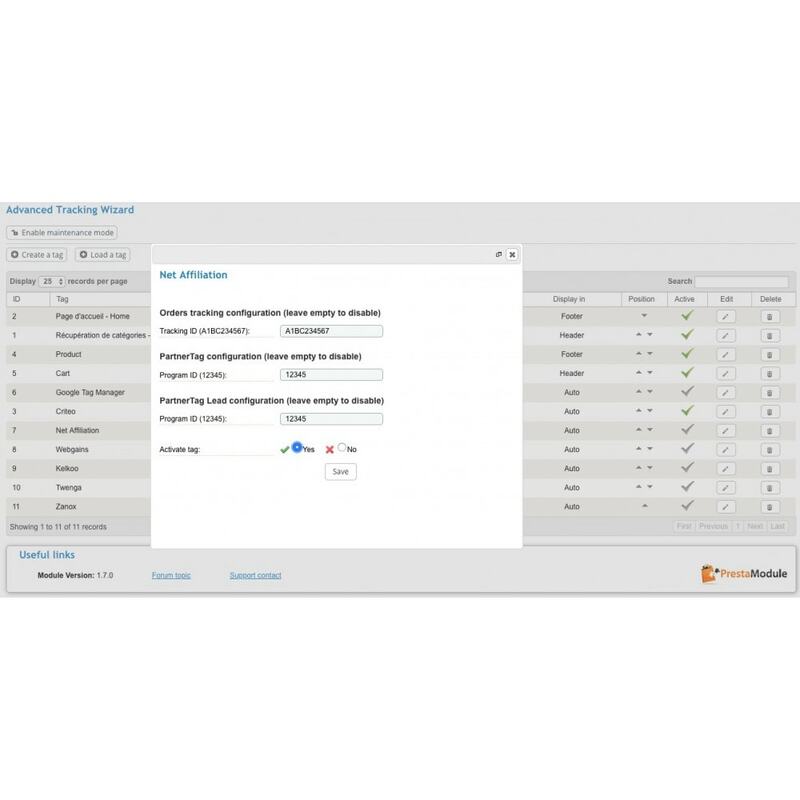 Simple and powerful, Advanced Tracking Wizard gives you complete autonomy to manage your tags, and lets you create re-targeting or re-marketing campaigns. 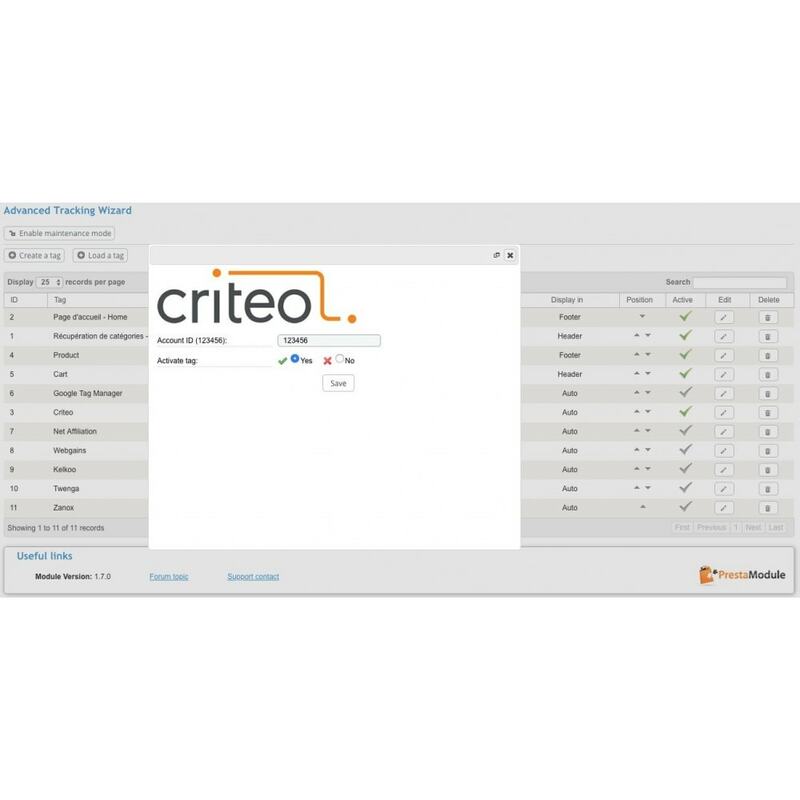 An exclusive maintenance mode enables you to validate the proper installation of your tags with your partners before production start. Choose the loading position (header or footer) for each tracker. 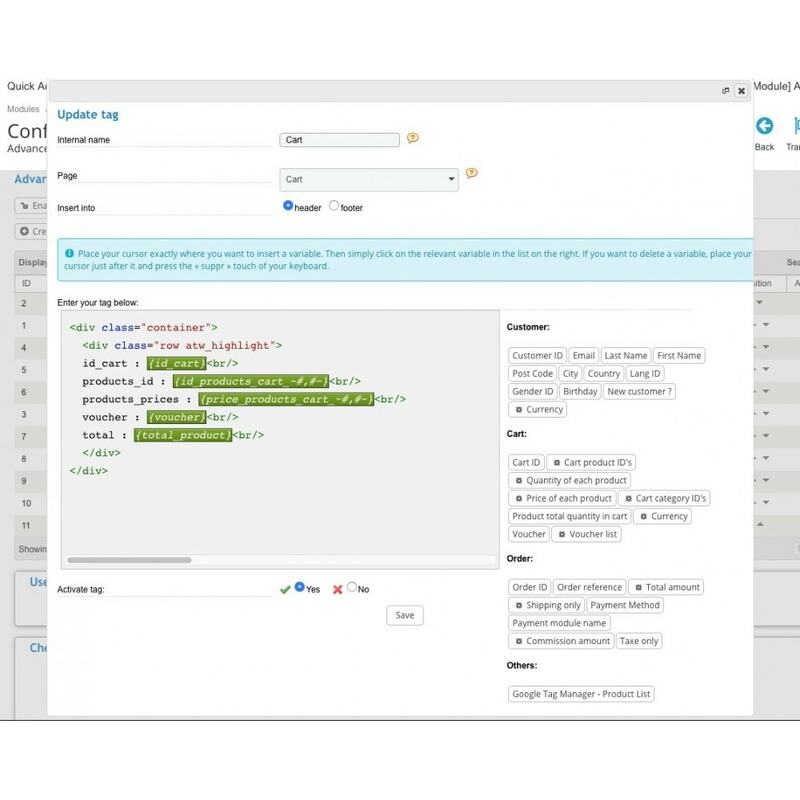 By installing this module you put into the pages of your website, one or more code snippets(tags) allowing, among other things, to track the activity of your users on your online store. The collected information may then be sent to your partners’ platforms for processing. Regarding this, we remind you that, as responsible for the use of personal data of your customers and visitors and in order to respect the new European General Data Protection Regulation, you must clearly inform your users in an easily accessible documentation(e.g. your Terms and Conditions) of how their data are collected and used. You must provide them with the link that will direct them to your partner’s personal data policy. You also must inform them of their rights, in particular their right of opposition to the use of their personal data and the means to assert their rights.